1. Combine the Flour, Cinnamon, Cloves and Salt in a medium size mixing bowl. 2. In a small bowl, combine the Yeast and Sugar with the Milk. 3. Cut the Butter into the Flour mixture with a pastry blender until the mixture looks like coarse cornmeal. 4. Combine the Yeast mixture with the Pumpkin and work into the Flour until the two mixtures are well-combined. 5. Turn out onto a board which has been lightly sprinkled with Flour and knead gently until the Dough is smooth. 6. Place the Dough in an oiled bowl, cover with plastic wrap and let rise for about 30 minutes. 6. 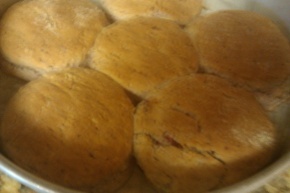 Divide the dough in half and roll out to 1/2” thickness; cut out with round or square biscuit cutters. 8. Adjust the oven racks to positions 2 & 4 and heat to 450 degrees. 9. Bake for 12 – 14 minutes or until golden brown. Serve warm with Cranberry Butter.